Tomorrow’s speech by Theresa May will address BREXIT negotiations and the timetable. It will be closely monitored by market participants. The speech is likely to trigger volatility especially in GBP. A hard BREXIT option appears to be the most favourable one. Markets are expecting that she will say that she is prepared to leave the EU customs union, as she wants to regain full control of the UK borders. Of course, this will mean that the UK will lose access to the single market and the benefit of the European passport. Since the start of Theresa May’s term, sterling has tumbled following uncertainty around this issue. Recently, the Prime Minister has vocalized the idea that she is prepared to exit from the European Union. This will prioritize immigration controls. Not single-market membership. 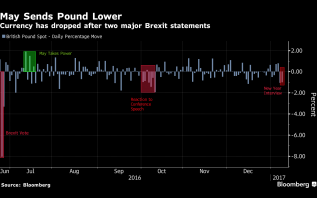 The fall of GBP since BREXIT is beneficial for export-oriented companies. But it penalizes consumption of imported products. It makes them more expensive. This has resulted in a loss of income for large importing companies. If they haven’t already – they could increase prices to make up for this shortfall. This will cause inflation. The weakness of sterling has helped the FTSE100 to set new record highs. Many London-listed companies book revenues in a foreign currency. Therefore the sliding pound represents a boost in their earnings power. It also makes exports more competitive”. GBP/USD is now at its lowest level since the beginning of October 2016. This is further compounded by the recent rally in the US dollar triggered by Trump’s election. GBP/USD is hovering above a support level at around 1.2000. But it is below an important resistance at 1.2131. The RSI is close to 30. The currency pair is still below the Ichimoku cloud, with prices below the Tenkan (red) and the Kijun (blue) lines. EUR/GBP is currently overbought, as shown by the RSI, which is currently above 70. The price has just exited the Ichimoku cloud, while the Lagging Span (fluoro green) is above prices, the Tenkan and Kijun lines. The line is just about to cross the cloud close to a twist. EUR/GBP might take a breather from the recent increase and head towards the support level at 0.8723. Sterling recovered some ground when Theresa May agreed that her plans would be subject to parliamentary scrutiny before triggering Article 50. 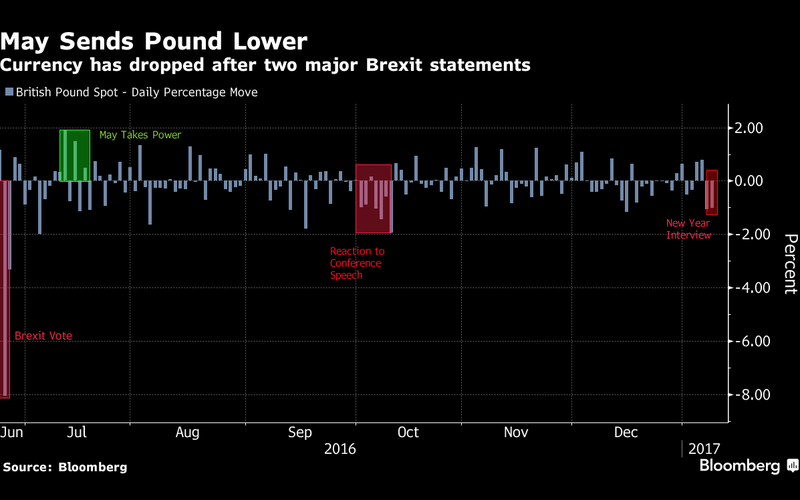 Investors thought a softer BREXIT would more likely to happen. If Article 50 cannot be triggered without Parliament agreement, this could be a game-changer in BREXIT negotiations. Indeed, the transition could be smoother, as numerous MPs are against the BREXIT. The UK leaving the EU is probably the most complex and important process that the British government has had to face in recent years. Parliament scrutiny is important. Many investors think it will contribute to a more cohesive decision. This will strengthen the Government’s credibility and negotiation position. Prime Minister May said she will trigger Article before the end of March 2017. But to be able to do so, the “terms of the divorce” will need to be set out.